Although just about anyone who spends enough time online to come across my little blog will probably recognize that this card is a nod to the RPG blogosphere stalwart that is The Other Side. +Timothy Brannan does some awesome work over there, giving great snippets of D&D history while consistently bringing something new to the game (one of his favorite muses: witches!). Oh, and he seems like a nice guy to boot. Tim isn't doing the A to Z this year, but he's tackled it multiple times in the past (along with being part of the crew that keeps the challenge rolling). So, overall, a tip of the hat from this blogger...and you should check him out sometime...! Oh! 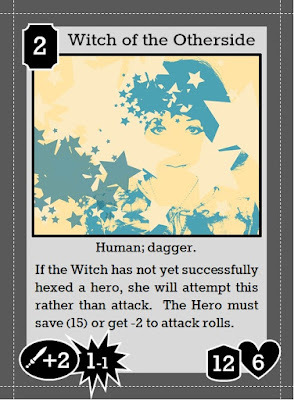 And I very rudely left this out in the tired state I posted in last night...big thanks to Justin of Halls of the Nephilim for his advice on a "witchy" ability that would be simple enough to fit onto a card. It's awesome having this online community as a think tank! It wasn't rude sir, but thanks for the shout out. This is one of my favourite "monster" cards of the challenge. I can accept "careless." And thanks again for the help! Dungeonstack A to Z: Locked!